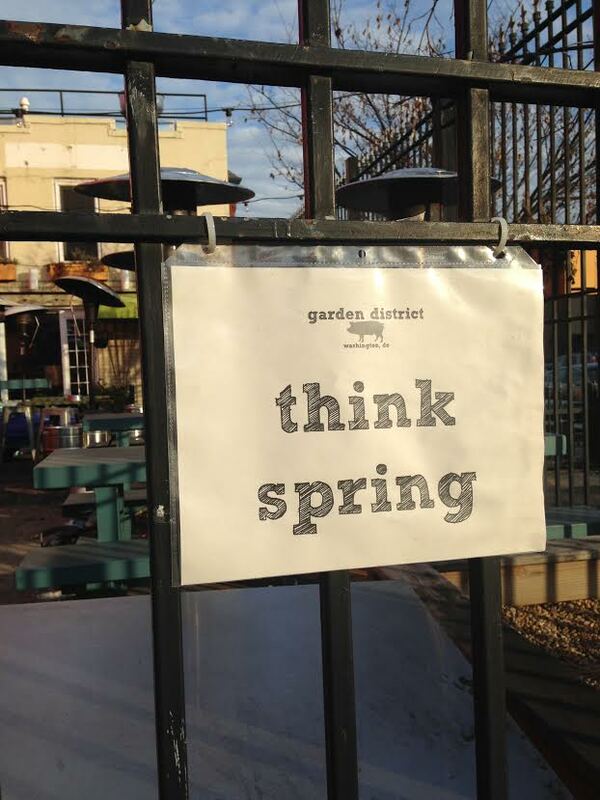 A few weeks ago, as I was lugging home groceries, I saw this sign: I’m not only thinking spring, I’m hoping and praying spring. And for this bar (which is outdoor only) to reopen. To help spring along (and to continue my quest to empty our refrigerator), I bought the spring-iest vegetable I know and turned it into a tart, inspired by my girl Martha. Preheat your oven to 400 degrees F. On a lightly floured surface, stretch & roll the puff pastry out a bit – be careful not to break it. Using a sharp knife, lightly score the pastry dough about 1 inch out from the edge, all the way around. Using a fork, lightly poke holes all over the dough and place on a large baking sheet. Bake the dough until golden – about 10 minutes. Remove the pastry shell and dot all over with ricotta cheese; lightly spread it about. Top with a big handful of Parmesan, the sliced onion, and then line the asparagus across – alternating spear to tip. Top with salt, pepper and some crushed reds. Mist or brush some olive oil over the tart. Pop the whole thing in the oven and bake for about 10-15 minutes. Puff pastry is such a savior and brings out the best of tarts. That tarts looks really good and such an easy recipe. I hope toh are having fun at Ff. Welcome to the party :). Pleasure is all mine Varinaj :). I love how puff pastry immediately makes you feel fancy…and you literally have to do NOTHING. My kind of meal! I think I might try this with the mushroom and goat cheese you suggested. 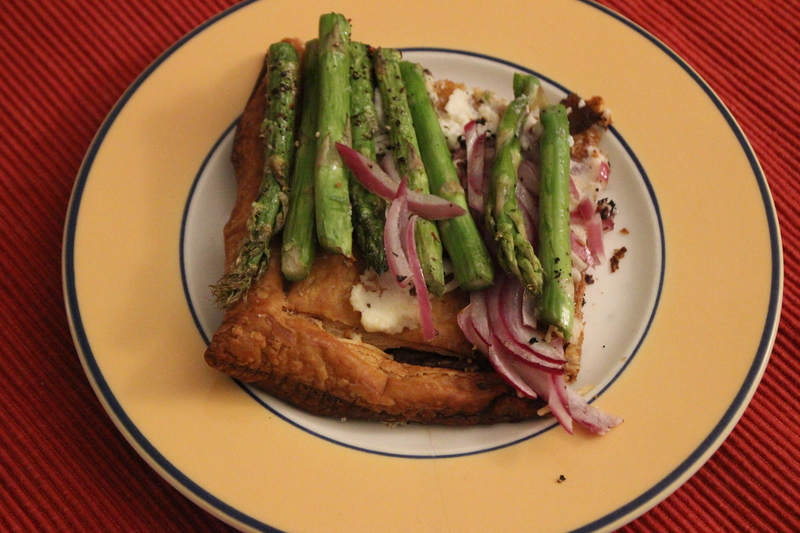 The asparagus make such a beautiful top to the tart! i’ve made with a bit of mushroom, goat cheese and spinach – the one thing i’ve found is that i have to be careful/watch the moisture of the mushrooms mixing with the puff pastry. would love to know how it goes & any tips you have! I am also craving spring and the first asparagus. This would indeed be wonderful with a poached egg on top. Great idea and combination of textures. I love all things asparagus, this looks yum! i’m waiting for the asparagus to get really, really good. roasted with just a little bit of olive oil, salt, and pepper…YUM! ooh make my mouth water why don’t you haha! i’d like to come to that potluck!! Next Next post: Menu Planning. Again.